When it comes to your swimwear collection for summer 2018, there are certain styles we highly recommend you invest in. From classic plunging one-pieces to fresh, vacation-ready tropical-print bikinis, this season is all about fun, flirty, and cool suits you'll wear nonstop. And we really do mean nonstop because many of the styles we've featured before (specifically the one-pieces) also double as bodysuits, meaning you can wear the swimsuit solo at the beach or pair it with your favorite cropped jeans for brunch with your besties. Now as for another style to add into your seaside wardrobe rotation? Ruffle swimsuits. Need we say more? 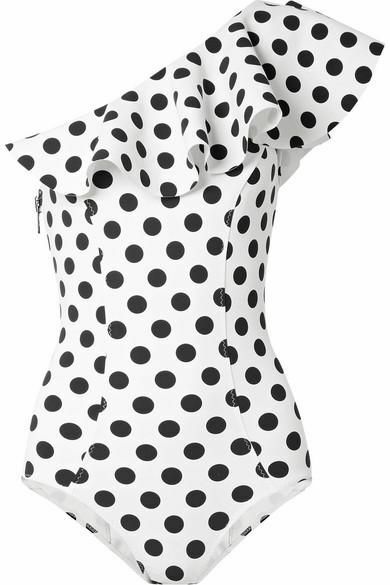 Whether you prefer a timeless black option or a bright-hued two-piece that will certainly stand out in the water, we've found all the best swimwear featuring the cutest ruffle detailing. From subtle shoulder frills to full-on ruching decorating the neckline, read on to see and shop your new favorite ruffle swimsuits to wear all summer long—compliments guaranteed. Available in size IT38 to IT46. Available in size 12 to 28. Available in size 0 to 3. Available in size M to XL. Want some more swimsuits? Then read on to shop the one-pieces with the best online reviews.